[Student] tells me he won first chair bass, and he’s the only freshman in his bass section! Thank you for all your good work with him!!! I teach out of my apartment in Oak Park, IL. I have plenty of room for the student’s bass as well as mine. Parent’s are welcome to stay if they wish – some do, some don’t and either way is fine with me. I have 20 years of teaching experience and am certified to teach public school in New York State and Illinois. I am primarily a classical player but I do have jazz experience. I am currently a German bow player but played French style for 12 years. I also play and offer bass guitar lessons. Electric bassists do not need to bring an amplifier. I am available for lessons via Skype/Video for players not in the Chicago area. 1. My students excel. Recently a student received a full scholarship to Illinois Wesleyan College. Other students have become conductors, string teachers, as well as pursuing other degrees including medicine. 2. I’m a teacher AND performer. I have a degree in each and I enjoy both. 3. I’ve studied with a wide variety of teachers and players. 4. Lessons are productive, focused, yet relaxed. 5. I’m organized and have a curriculum. 6. I provide a well balanced musical diet. Please pay at the time of the lesson unless other arrangements are made. I recommend that new students begin with a 45 minute lesson and we can evaluate the student’s needs from there. If you need to cancel please give at least 24 hours notice. Let me know as soon as possible so we can find another time slot for the student. Of course, I do understand that emergencies do occur. Just drop me a quick text or email so I know what’s going on. Students are expected to put forth effort and persistence! Any skill in life takes time to develop. You just have to keep at it. However, I do reserve the right to discontinue lessons if the student is repeatedly unprepared / not practicing. 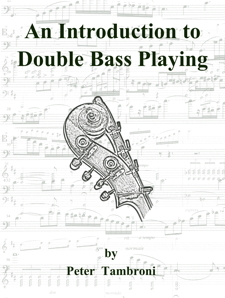 Students should bring their bass to each lesson unless other arrangements are made with me. If you need to rent an instrument, contact for me rental recommendations. I use the following texts that students will need to purchase if they continue studying. You can purchase them from anywhere you’d like – the links are provided as a convenience. Also please purchase the a composition notebook – NOT a spiral bound. The above will definitely be used and you will probably be asked to purchase one of the Sevcik below. Etude books such as Slama and Hrabe. Scale Studies by Schwabe / Zimmerman. A Contemporary Concept of Bowing by Frederick Zimmerman. Excerpt / Orchestral Study books by Zimmerman. Before I begin my curriculum I want to build upon what the student has been working on. There is no reason to ignore the work they are doing in school. I approach the entire fingerboard in a scaffold approach. I’m a firm believer in the traditional -albeit boring- Simandl method. Every student that uses this has a firm grasp of notes on the fingerboard and their position / relationship to each other. However, Simandl starts in half position and slowly works his way up. This creates an imbalance where students are very comfortable in the lower positions and lack confidence in the upper register. Supplementing this with Thomas Gale’s “Practical Studies” which moves from I to IV positions using solid reference points gets students shifting – and shifting IN TUNE. This creates flexible left hands and fingerboard knowledge. Soon after adding in some reference points in thumb position (and filling in this scaffold with Simandl) creates a bassist that is comfortable, solid, and even throughout the register of the bass. Sevcik School of Bowing Op. 2 – Neil Tarlton edition. This is a vital aspect of the aspiring bassist. I address as soon as possible or necessary with skill appropriate and aspiration appropriate literature. Early starting points include looking at what the student may currently be playing in ensembles, the literature at the end of Simandl book 1, the Zimmerman collection of excerpt books, and current audition requirements of professional organizations and colleges.